Correction deeds are sometimes called confirmatory instruments. As such, they confirm and perfect an existing title created earlier and remove any defects from it, but they do not pass title on their own. They make explicit reference to the instrument that is being corrected by indicating its execution and recording date, the place of recording and the number under which the document is filed. They also need to identify the error or errors by type before supplying the correction in the subsequent body of the deed. 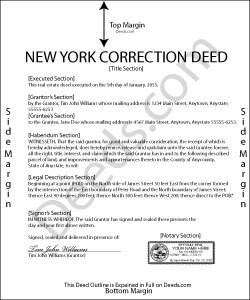 A new real property transfer report, RP-5217-pdf (or RP-5217NYC), with original signatures must accompany all deeds in New York, including correction deeds; the same goes for the tax affidavit TP-584, which both seller and buyer must sign. Forms are available at the county recording office or can be ordered online (but not downloaded). As a correction, the transaction may be exempt from transfer tax. Be sure to include proof that the transfer tax was paid, either by including the original cover page of the prior deed, or by providing an affidavit stating that transfer tax was paid with the prior document. Furthermore, counties often require a cover page, which may be specific to the county or city and provided on their websites. It serves to identify the document more easily and may be called "recording and endorsement (cover) page." New recording fees per page must be paid for a correction instrument. Linda W. said: Got the forms, very straight forward. No problems completing them. Reply from Staff: Thanks Linda!